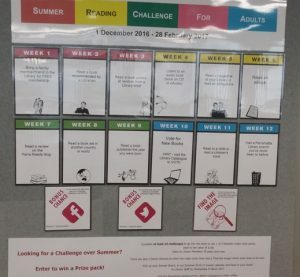 Summer Reading Challenge for Adults is now open! Looking for a Challenge over Summer? Welcome to our Summer Reading Challenge Competition for Adults! Complete at least 10 challenges over the weeks of Summer to go into the draw to win 1 of 3 fantastic major prize packs, each to the value of $150. Open to Library Members 18 years and over. Challenge starts 1 December 2016 and ends 28 February 2017. There are also 2 bonus chances to enter the major prize draw and a ‘Find the image’ minor prize draw to be won. Pick up your Answer Board, in our Summer 2016-17 events calendar and hand in your board to Library Staff by Wednesday 8 March 2017. Can’t get to the Library to collect your Board? You can view and enter each challenge online here. This entry was posted in Competitions, eLibrary, Fiction, Non Fiction by Parra Reader. Bookmark the permalink.